BPI’s latest blog post shows how small business lending among the largest U.S. financial institutions has weakened due to constraints from the Federal Reserve’s stress tests and capital surcharges for systemically important banks. BPI research finds that originations of small business loans from banks subject to the Comprehensive Capital Analysis and Review (CCAR) remained depressed after 2010 and are just about 65 percent of their level in 2006 while originations from banks not subject to the stress tests have recovered somewhat in the post-crisis period. 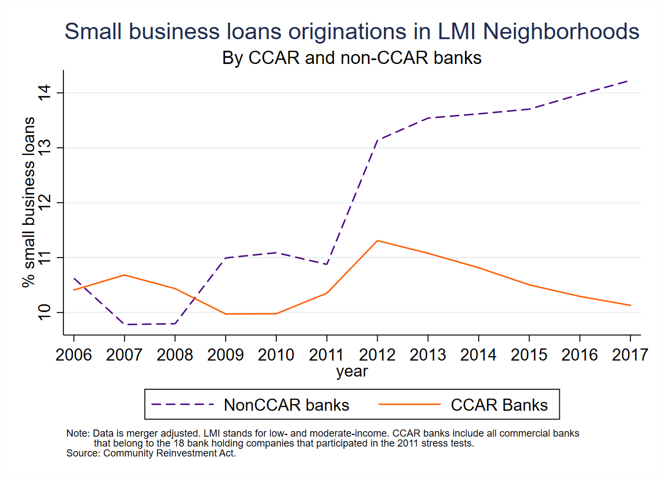 Furthermore, the share of small business loans made in low-and moderate-income (LMI) neighborhoods by CCAR banks has been steadily declining since 2012 while LMI small business loan share by banks not subject to CCAR has increased (see chart below). Small businesses account for 66% of new jobs and the decline in credit availability to small businesses reduces the ability of the country to grow at its full potential and leads to wider wealth disparities across households. Moreover, tight access to bank loans also pushes borrowers in LMI communities to less stable sources of credit such as nonbanks. Francisco Covas, Head of Research at BPI, underscored the above research at the Financial Stability Board (FSB). The FSB is conducting an evaluation of the effects of the G20 reforms implemented to date on the financing of small and medium-sized enterprises (SMEs). On December 12, the FSB’s evaluation team hosted a roundtable with industry representatives to discuss recent trends and the main drivers of SME financing across FSB jurisdictions. Covas discussed how post-crisis reforms, such as capital surcharges for global systemically important banks, the U.S. stress tests and Dodd-Frank Act compliance contribute to the weakness in small business loans on banks’ books. The Financial Stability Oversight Council held a meeting on December 19 and discussed the current expected credit losses accounting methodology (CECL) among other topics. In advance of the meeting, BPI, the American Bankers Association, the Consumer Bankers Association, the National Association of Federally Insured Credit Unions and the Credit Union National Association issued a joint trade statement commending the FSOC for discussing CECL at their meeting. Also in advance of the FSOC meeting, 28 House Republicans sent a letter to the Treasury Secretary and FSOC Chairman Steven Mnuchin to seek a delay in CECL’s effective date until a comprehensive analysis on the standard has been completed. The lawmakers said the new standard would be burdensome on banks and individuals wanting to access credit. On December 14, BPI submitted a letter to the Federal Reserve responding to its proposal to establish its own real-time gross-payment settlement (“RTGS”) system. BPI cautioned that the proposal is “both unnecessary and unwise.” The letter urges the Fed to refrain from directly entering the marketplace with its own faster payments system unless the private sector has proven unable to do so and emphasizes the range of policy issues—including innovation and privacy concerns—arising from a real-time payments system placed directly in government hands. The Clearing House also filed a comment letter to the Federal Reserve Board explaining why TCH’s RTP network is able to provide a ubiquitous, safe, efficient, and equitable faster payment system by 2020 and highlights the reasons why a Fed RTGS could actually harm the movement toward faster payments. BPI announced the hire of Fabrice Coles as Vice President of Government Affairs. Coles’s portfolio will focus on consumer and fintech policy issues being considered by policymakers in the legislative and executive branches. Coles previously served as the Executive Director for the Congressional Black Caucus (CBC) where he provided counsel to the CBC Chairman and members and executed the strategic agenda of the caucus. Coles will start on February 4th. On December 19, the FDIC issued an Advance Notice of Proposed Rulemaking (“ANPR”) requesting comment on its brokered deposit and interest rate cap regulations, signaling a comprehensive review of its regulatory approach in light of significant changes in technology, business models, economic environment, and products since the regulations’ adoption. Through the questions posed in the notice, the ANPR indicates the FDIC’s willingness to reconsider classes of deposits that may have been misclassified as brokered. The ANPR is an important step towards implementing necessary reforms to the brokered deposit regulatory framework, an issue on which BPI and its predecessor organization, The Clearing House, has worked for many years. On December 19, the FDIC approved an interagency proposal to modify Volcker Rule regulations to reflect statutory amendments enacted into law in May with the Economic Growth, Regulatory Relief, and Consumer Protection Act (S. 2155). The proposal would exclude certain small firms from the Volcker Rule that have less than $10B in consolidated assets and total trading assets and liabilities below 5% of total assets. The proposal would also amend restrictions on bank relationships with funds to generally permit a hedge fund or private equity fund to share the same name with a bank-affiliated investment advisor. On December 19, the FDIC approved the interagency final rule on CECL largely as proposed, to go into effect April 1, that would include a transitional arrangement by which the “day one” impact of the adoption of CECL would be phased in over a period of 3 years. Notably, the decision came the day before the FSOC met in closed session to discuss CECL, and a day before the Financial Accounting Standards Board’s (FASB) announcement that it will host a public roundtable discussion, likely in January 2019, on the implementation issues of the CECL. The roundtable will discuss FASB staff’s research on CECL and a proposal by banks to consider an alternate to the income statement impact of the CECL model. The FDIC today issued a notice of proposed rulemaking (“NPR”) that would revise the agency’s requirements for stress testing, consistent with changes made in the Economic Growth, Regulatory Relief, and Consumer Protection Act (S. 2155). In conformity with the statutory revisions, the regulatory proposal would require two rather than three stress testing scenarios, change the frequency of stress testing from annual to periodic, and raise the minimum threshold for applicability overall from $10B to $250B. The proposal also makes several technical conforming changes, including changes found in the agency’s April 2018 NPR that were superseded by the passage of S. 2155. Representative Blaine Luetkemeyer (R-MO) introduced legislation on December 20 that would require federal agencies to explicitly clarify guidance documents are not legally binding. The aim is to ensure that regulators can’t use guidance to circumvent the Administrative Procedures Act. The legislation follows a letter on December 17 by Senate Banking Committee Chairman Mike Crapo (R-ID) to the banking agencies where he said an agency guidance document on bank stress testing “cannot be enforced because it wasn’t submitted to Congress as required by the Congressional Review Act.” BPI and the American Bankers Association recently petitioned for a formal rulemaking regarding the use of supervisory guidance. This paper analyzes the relationship between federal mortgage market programs and the economic shocks felt by households during and after the financial crisis. The article uses county-level data on the penetration of programs from the Federal Housing Administration (FHA), the Department of Veterans Affairs (VA) and the government sponsored enterprises (GSEs) Fannie Mae and Freddie Mac. The authors find a strong correlation between a greater use of these programs and better real economic outcomes such as lower unemployment. In addition, the analysis shows that the FHA was a more effective countercyclical tool than GSE lending. These results suggest that a tight link between a government-backed insurer and the GSE would mitigate tighter underwriting standards and higher securitization costs during a crisis, which the authors encourage future GSE reforms to consider. This paper explores the potential impact of digital currency on the stability of the banking system. 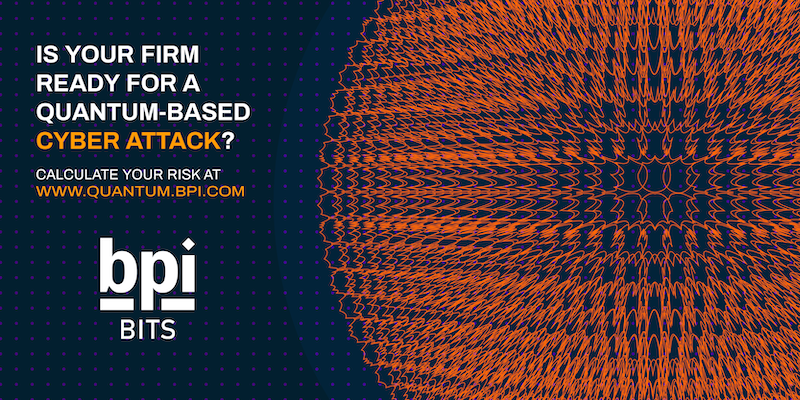 It develops a model of an economy where the introduction of digital currency competes with traditional fiat money. The author shows that privately issued digital currency, such as Bitcoin, will be held if the inflationary risk of fiat money is sufficiently large. This dynamic does not necessarily displace the banking system, as consumers may hold deposits of digital currency at banks. However, this allows for a banking crisis equilibrium as banks are vulnerable to withdrawal runs on digital currency. This column presents a new theory of information production in credit markets and uses this theory to investigate the macroeconomic effects of collateral booms. The authors model the credit market and find that, in equilibrium, lenders rely more on collateral (i.e., real estate) as the price of collateral rises. Fewer projects are screened during a collateral-driven credit boom, which leaves the market lacking information on entrepreneurial projects. When the boom ends, lenders intensify screening, which exacerbates the crash and slows recovery. This paper incorporates a variety of biases, mistakes, and bounds on rationality into the neoclassical growth model, providing a framework for answering questions about policy changes under this set of behavioral assumptions. The authors do so by decomposing the response of the economy into a direct response to given prices and an indirect response as prices evolve and the economy makes its way to a new equilibrium. They find that behavioral biases that work through the indirect response never change the qualitative long-run outcome; biases only matter if they change the direction (positive or negative) of the initial shock.